It was an early summer day, about ten years ago. West Suffolk was in full leaf, and I cycled along the Glem Valley from Hartest, looking for this church. The trees thickened, until the road was lined with woodland as much as fields. A sign pointed off eastwards: Boxted Church 1/4 mile. I think it was perhaps the longest quarter of a mile that I've ever cycled, steeply uphill and out into the countryside again. The church is hidden by trees, and the lane up to it comes as a surprise, at a corner. The setting is fairly typical for this part of west Suffolk, the rolling valley falling away to the east and a great country house somewhere below. Rede, the highest point in the county, is the next parish along. Slow sheep cropped the grass beyond the hedge, and eyed me lazily. I came back to Boxted on a frosty day in the late October 2009, the sun at last out dispersing the mist we had walked through across the Chadacre estate, and I was pleased to be back in this strange, beautiful place. 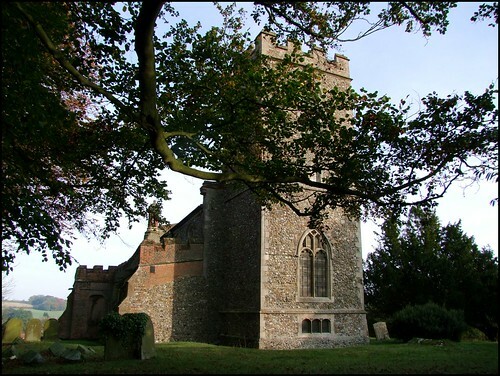 Despite its location, All Saints is one of the better known parish churches of Suffolk, and we will see why in a moment. But from the outside it does look unfamiliar, for to the north side of this pretty medieval church is a large, boxy red brick aisle and chapel, with few windows, and the curious domed smokestack of a chimney rising from one corner. Flint in the walls suggests that there was an earlier north aisle here. What on earth has happened? Well, this is the early 18th Century work of the Poley family, the Booxted Lords of the Manor. At the moment of swapping time for eternity, they have become frozen in time here. If you go inside, we can see them. When I first came this way I was young and fiery, and rather dismissive of grand monuments. I have grown to admire much of the post-Refomation work in East Anglia's churches; but I suppose that I still feel a bit uncomfortable with the way that, from the mid-16th century onwards, our churches were usurped for a show of family power, often with monuments that are the height of vulgarity. Of course, there were grand memorials before the Reformation, particularly in brass. But these seem to have retained a sense of piety, an acknowledgement of the family's participation in the economy of grace, as well as that of land and money. In the 18th Century in particular, memorials intend to demonstrate secular power, and are often wholly pagan in character. Medieval churches often had chantry chapels for local landed families, where they could be buried and have Masses said for their souls in what they believed would be perpetuity. These chapels often became the mausoleum or private aisle for the family once the Reformation had declared prayers for the dead to be useless. Occasionally, the churches where these great families remembered themselves became entire private chapels - Hengrave, for example, which became a mausoleum for a recusant Catholic family. But most often, as at Helmingham, Framlingham and here at Boxted, they continued as Parish churches after the Reformation. But Boxted is slightly different. What makes Boxted remarkable is that the family that glorified itself here, the Poleys, did so rather late, and in the late 17th and early 18th centuries seem to have attempted to recreate a 16th century mausoleum church by building a fake pre-Reformation chantry chapel. Why did they do this? Probably, to try and make it look as though they were a more established family than they might have appeared otherwise. So they built the north chapel to the chancel, certainly the only one built in the whole of Suffolk in either of those centuries. Probably, the attempt to make it look like an ex-chantry chapel is based on the same (but genuine) thing at nearby Somerton. At this time, antiquarians were beginning to rediscover a fascination with the past; late 16th and 17th century church architecture normally reaffirms and celebrates the Reformation and its break with the past. As I say, at the Reformation the chantry chapels often became family mausoleums; and so, the Poleys created their own. Apart from the extensive late 17th/early 18th century work, this church was thoroughly restored again during the 19th century. There's never been a shortage of money here. Virtually all the woodwork is 19th century, although the pulpit is older, and so is the chancel roof. From the 16th century is Boxted's earliest tomb, on the south side of the chancel. This is most striking, and it is only when you get up close that you see the jet black effigies are not marble at all, but wood. The oak has blackened with age. This is a rare revival of the wooden effigies popular in the 13th century, and found in Suffolk at Heveningham and Bures. This one is to William and Alice Poley, and was made after 1587. The chancel floor is paved in ledger stones for various Poleys. To the north is the Poley mausoleum itself, and the grand statues are of Sir John Poley, who died in 1638, and Dame Abigail his wife, who died in 1652. Interestingly, the statues are much later than these dates, Sir John's being made in 1680 and Dame Abigail's as late as 1725, which probably dates the chapel which now houses them. There are later members of the same family remembered in the chancel: a south side window remembers Edward and Ursula Hallifax-Weller-Poley. The window depicts St George and St Francis above medallion portraits of the couple. Sir Edward is shown in WWI uniform, and Ursual in the costume of an Anglican nun, which she became after her husband died in 1948. She founded the Company of St Francis in Gateshead. Their son Hugh was killed at the age of 20 in the Second World War, and the good modern east window remembers him, depicting Christ in Glory standing above Boxted parish, the church and the Hall set among scenes of animals and birds.The opening above the chancel arch seems an echo of the one at Polstead, and is intriguing. I wondered if it had something to do with the rood, but it was only put in in the 1890s, at the same time as the medieval canopy of honour was taken out - an extraordinary act at so late a date, and one that can perhaps be put down to the local Big House getting its own way. This is a beautiful and fascinating place, but it must be said that here is less a sense of the numinous here than in some other medieval churches. Continuity was fractured, and the Poleys' work removed this church from the liturgical and devotional context in which it was built. But here is an important document of one landed family's act of memory, and it is worth seeing for that alone.